We’re on the countdown for Thanksgiving folks. I can hardly believe it! Soooo looking forward to the turkey and stuffing and mashed potatoes and gravy….and all the other fixins. There are many friends and family pages to come from this holiday season and so I felt inspired to make a kit about being together and being grateful and love for this time of thanksgiving. Eleven words+phrases that are individual, so you can stack them up like this + weld them together to make one cut, place them in a line or add them as an overlay to your photo. 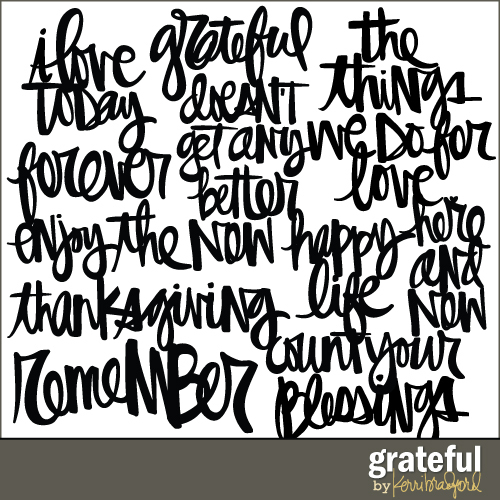 Love Thankgiving! We celebrate two in our family since I am Canadian. We have one in Oct too!